← Monday Question – How would You Perfume Your Favorite Movie Star? I was invited to talk at a Perfume Lovers Meet Up in London this spring, organized by the lovely Lila Das Gupta. I will talk about my favorite fragrant subject – Amber. So if you happen to live in or around London, I would love to see you there. Seating is limited, so please sign up early! 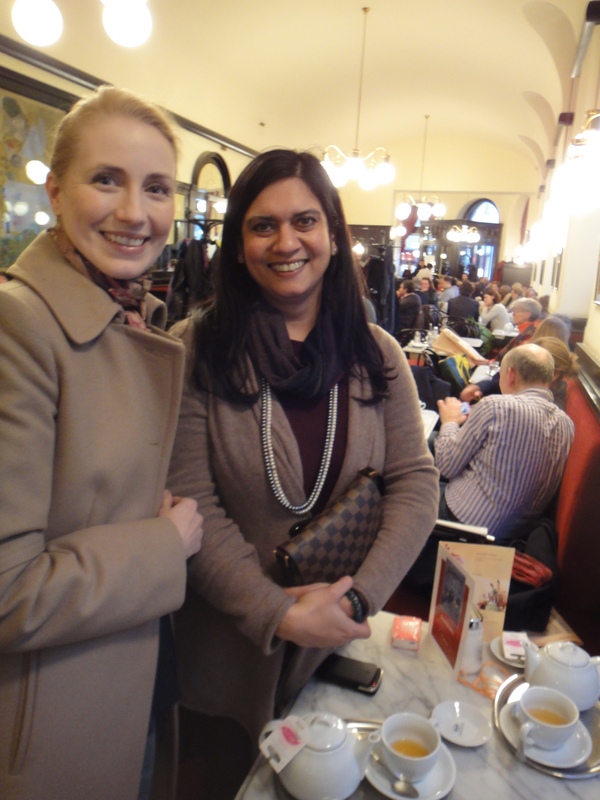 I wanted to share this photo with you, this was taken in Vienna a few weeks back, when I met the amazing Neela Vermeire. I look very weird here, sorry, but Neela looks just as lovely as she is in real life. This entry was posted in Ramblings and tagged Amber, London, Meet Up. Bookmark the permalink. I’m leaning towards Mohur as well at the moment. 🙂 I so hope you can make it! It would be lovely to catch up. I’m all signed up for the Meet Up! Vanessa is right, you don’t look even a tiny bit weird. You look chic and flewless as usual. Neela seems lovely. Wondering which of her Creations to purchase when you run out is a nice dilemma tohave. Yay! Great to know you’ll be there! Thanks, B, I look forward to it! Ambers, my favorite subject. Sounds wonderful, I just wish I wasn’t across the pond! I can’t wait to hear all about the event afterwards. Would you consider recording your lecture to share with all of your fans across the pond? Wish I could be there in London!!! No, you don’t look weird ! Beautiful photo of two beautiful ladies. You do not look weird. Can’t help you decide which Neela Vermeire creation to purchase a FB of, as I have the same dilemma. Alas, I’ve spent my perfume budget for this quarter, so I must wait a while before I purchase anything else. You look absolutely stunning! Very classy, beautiful face and smile! Thank you! What a compliment! I’ll cherish it. Is there a chance of recording the talk and uploading it – as a podcast, youtube, etc.? Good idea! Thank you! You are always so practical! How awesome that you got to meet Neela Vermeire and that you’ll be speaking in London! Wish I could be there. Will look forward to hearing about it. Versilia Vintage Ambra Mediterranea by Profumi Del Forte and Manoa by Memo are two fantastic amber fragrances. Memo fragrances – especially Manoa and Shams – are defintely on my radar. I will make sure to give the one by Profumi del Forte a try as well. Thanks for your suggestions. When you come to London, Something you must try. Roja Dove has just launched the extract version of his Diaghilev scent in Harrods, the way it was first designed to be. It’s a real stunner, but £750 for 100ml = ouch!. I see two pretty ladies- nothing weird. I am sure your talk will be wonderful, and wish I could be there. B, you’re an absolute beaut, as is Neela, and it’s a lovely picture! As for for the talk, I would not miss it for the world!! Again I have to say it – you are the best! Hugs and kisses! Can’t wait to meet you in person! Weird? Not so! You’re beautiful, and so is Neela. Really looking forward to having you Birgit! I look forward to meeting you in person, Lila!